There is a celebration on New Year’s Eve called First Night that occurs all across the country and celebrates the new year in a family, non-alcoholic way (which sound totally weird to me, but to each his own). They celebrate by dropping all kinds of things in much the same way as the ball drops in NYC. For example, here in the Raleigh, NC area, they drop a huge acorn (don’t ask me why). 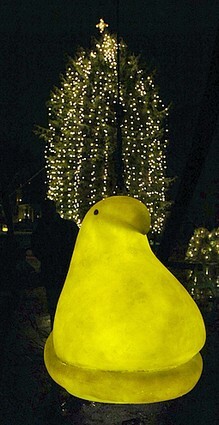 This year, in Bethelehem, PA, they dropped a huge yellow Peep. For those that don’t know, a Peep is a marshmallow candy found mostly at Easter time. The Peep they dropped was four feet tall and made of fibergalss – it was 200 times larger than a normal size Peep. The company that makes Peeps, Just Born even “donated Peeps for roasting at charcoal fires on the plaza.” I never even considered roasting Peeps. I need to try that sometime. Peeps, on the whole, just don’t do it for me really. Speaking of Peeps, stop by Peep Research sometime for a good chuckle. At Peep Research, they conducted lots of scientific tests on Peeps and documented everything. They analyze their reaction to cold, heat, and low-pressure environments. 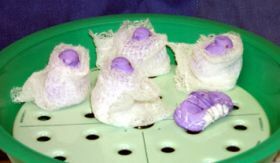 They do solubility testing on Peeps and even delve into subjects like “Investigating the effects of smoking and alcohol on Peep health”, “Quintuplet Peep siblings, conjoined at birth, have been separated through this daring application of modern medicine”, and they discover what causes the Fear Response in Peeps. Funny stuff. OMG, Peep Research is hilarious! The picture of the bandaged separated quintuplets is just priceless. I’ll have to try roasting a Peep sometime… I can’t really decide if the sugar coating would be a good or a bad thing. My mom thinks I like Peeps for some reason (I guess because I love every other marshmallow thing ever invented) so I tend to have some of the insipid things lying around. RESPONSE: Glad you like the Peep Research link! You’re right – that pic is much better – so I switched the pic in the post. I’ve never been fond of fresh peeps (or fresh red vines either for that matter). I like them when they get all hard and crusty and really chewy. I suppose it’s a good thing because they’re a lot cheaper after the holidays. As for toasting a Peep, it’s VERY easy to catch them on fire because of the sugar crust and also very easy to burn yourself on the molten, bubbly sugar because it’s so sticky.